Bracelets are fairly large jewels, crafting them takes advanced skills. When you have bracelets studded with gems or diamonds, the production process becomes even more complex. Kaisilver experts strongly recommend a custom bracelet, this option will get you better quality and also provide a more secure value for the money that you spent. Make sure that you read this report well, it highlights the essentials of a fine bracelet and goes on to explain why a made to order piece is so highly recommended. No restriction on design or gemstone choice, can combine different gems. The design for your custom bracelet can be yours or ours. Good workmanship and gem quality for both gold and silver bracelets. Both gold and sterling silver bracelets have an optimized metal weight. Equal emphasis to good looks and long term durability. Available in 10k, 14k and 18k gold, select white, pink or yellow gold. Custom silver bracelets maintain the same quality standards as the gold pieces. When you talk about a readymade sterling silver or gold bracelet, it is a jewel that is invariably made in multiple pieces. These bracelets might then be kept in a single showroom or spread across a few. The jeweler needs to get back his investment in the jewels, this can happen only when a sale is made. A sure way to attract attention is to offer the jewel at an attractive price. And in order to get a friendly price point, the jewel will need to save on metal weight, workmanship and gemstone quality. Sit back for a moment and think about it, these factors in reality explain why you will not end up with a superior quality bracelet. The jeweler is fully aware that investing insufficient metal weight in a large jewel like a bracelet, is bound to reduce the life of the piece. But market mechanisms take priority and you end up becoming the victim. Now let us talk about a custom bracelet, a piece that is made just for you. Tto begin with, a true custom jewelry provider should place no restrictions on design and gemstones for your bracelet. So if you have any specific ideas in mind, make sure that you communicate them to the jeweler. Another very important aspect of a made to order bracelet is the quality of gems and workmanship. Since the jeweler need not keep an eye on the general market, the jewel can work on a price point that is reasonable for the quality. Since most gemstone bracelets would have more than one gemstone, you could think of combining different gems and even include a mix of shapes and sizes. While much of the production process for readymade bacelets would be mechanized, a custom made piece would significantly rely on the expertise of artisans. Durability is a must for all jewelry and gets even more important when it comes to a bracelet. Given the size and complexity of a bracelet, it is easy to understand that a quality piece cannot be cheap. Lack of durability can cause the bracelet to snap or the clasp to fail, you could end up losing the bracelet as it slips off your wrist. Bad craftsmanship and insufficient metal weight will result in loosely mounted gems, lost gems or gems that drop off will require expensive repairs and replacements. While metal weight is not the only factor that decides just how sturdy your bracelet is, it does have a significant impact. A custom made bracelet can optimize the gold or silver weight for the bracelet, this could be decided based on the dimensions of the piece, the number of gems being mounted, the design elements and the length of the bracelet. A made to order bracelet will involve a production lead time but, it is surely worth the wait. Begin your search for a bracelet well in advance of the required date. Spend some time reading the information provided by the jewelry provider. The online rush to sell is bringing in a dangerous trend where, jewelers disclose scarce information and instead on a fancy website and a smart sales pitch. Communicate with the jeweler and evaluate the response, do you feel being pushed into a purchase, is the information provided useful and professional. Once you have all this information available to you, go to the next step of placing the order. Before you make a price comparison between different bracelets, make sure that you evaluate all the features thoroughly. For example, Kaisilver bracelets will have a metal weight that is at least 40% to 60% more than what other jewelers would provide. While this does shown on the price tag, it also means that you save on frequent repairs and replacement expenses. A team of highly skilled artisans and gem experts works on each custom bracelet, equal attention and quality is provided for silver and gold pieces. How To Buy: With over 7,000 satisfied clients across the globe, Kaisilver is regarded as the most preferred online source for high end custom jewelry. We can craft any type of jewel in gold or 925 silver based on your design. With unmatched access to both rough and cut and polished gemstones, we place no restriction on your choice of gems. 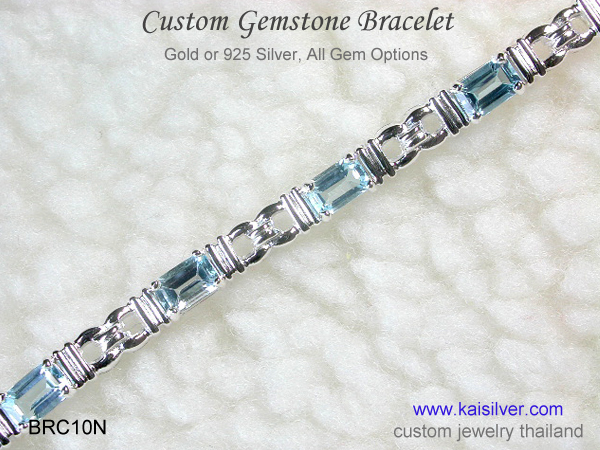 Review the Kaisilver Custom Bracelet Collection and learn about our quality bracelets. Remember that the design can be provided by you or picked from our website. You can combine different gems in the same bracelet and also mix different gem shapes and sizes. Send in your questions and requirements to the expert team at sales@kaisilver.com you will be provided with suggestions and tips without, being pushed to buy anything.